THERE are very few things I like to paint more than trees. There is something just as mysterious and inviting about a cluster of trees as there is about a lone tree. It might be subtle value shifts, one of the hallmarks of true beauty, that intrigue me. But the same reasons that make me want to paint trees, their mystery and majesty, also makes them extremely difficult to paint. The first and most important aspect of a tree, easy to overlook in bright glare, is that the main mass of a tree is basically one value. This is a hard to absorb because when you're looking at a tree it appears as though every value is represented in its form. But take the nine value grayscale outside and carefully note the values. You will be surprised at the closeness of the value range. The light and dark are often multiple variations of one basic value. Many people make the mistake of painting the foliage too light on one side. Or worse painting dabs of light all over the illuminated foliage. This gives a spotty, fractured look to what should read as one large shape. The second most important aspect of a tree is not the native color of the species nor the texture of the leaves and bark but rather the color of the light and the quality of the air that surrounds the tree. All trees project themselves into the bluish envelope of the atmosphere. So as a tree protrudes into the sky it will pick up more blue and its edges will turn bluer yet. At the base of the tree the reflected light from the ground will be warm. This warmth will be accentuated at the center of the tree where the light will get warmer (and darker) as it is reflected off of the bark and undersides of the leaves or needles. Every tree should be treated as an individual. Masses of trees, whose values are so similar they read from a distance as one large value zone, can be treated as a group. But it is a grave mistake to paint any tree using a formula. That will lead to a mannered way of painting lacking the originality and surprise so necessary to great painting. 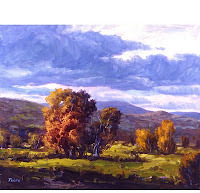 I mention these tips on painting trees as a means to observe what you may now be failing to observe, the flurry of values and hues that convey the beauty of trees. This is very interesting--could you give some more specific examples. Your blog is very helpful--I look forward to reading your posts and have learned a lot. Thank you. You're creating a great art blog here. Ive been reading from the beginning. I'm really thankful that you've undertaken this project. I'd like to suggest some video on composition for a future content. I plan to do a video that more fully explains my ideas regarding the color of trees where I will basically paint a portrait of a tree. We'll see if I can pull that together soon. That's a great idea about doing something on composition. I will put some thought into that, perhaps fusing linear composition and patterns. Many thanks for your comments. Your feedback is much appreciated!